Your Email Lists are always displayed on the left hand side of your GoDaddy Email Marketing Subscriber area. Most of your email lists are totally customizable, but a few lists are automatically included in every account. The all list shows every contact that is currently active in your account. If you upload contacts to your active subscribers and don't select a list, the contacts are added here. Any contact that belongs to a separate list in your active subscribers will also always belong to your all list. Think of it as the master, active email list. There are never any duplicate contacts in your subscribers, at all. So there aren't any duplicates in your all list, even if you have the same contact in multiple other lists, as well -- think of those other lists more as filters. With the signups list, you can see every contact that's signed up through one of your official signup forms. These contacts will also be part of your master all list, and any specific list you connect to your signup form. Some signups may be unconfirmed; that's normal! This just means that they've signed up through a form set to double opt-in, and they haven't confirmed their subscription yet. You can manually confirm them, but be careful! Make sure that you know who they are (or that their email address looks legitimate) before you manually confirm. Keeping the unconfirmed signups out of your active subscribers is for your safety. You can always export your signups list to view subscribe timestamps, too. And if you'd like another layer of signup details, try adding the Signup IPs add-on. This list is where inactive contacts, contacts that have bounced, unsubscribed, or marked you as spam are stored. These contacts aren't in your all list and are never counted towards your account plan level total. Any contacts who are "Unconfirmed" in your signups list are also in your suppressed list. They don't count towards your subscribers total, either. Some add-ons provide list sync tools. These synchronized lists are found in the automatic list area, under the signups and suppressed lists. 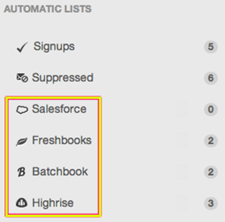 The best way to make changes to these these lists -- for example Batchbook, Highrise, or EventBrite -- is through the add-ons menu. From each integration's add-on page, you're able to test list credentials, sync new contacts, or remove lists entirely.